In the SIN group we apply and develop various atomistic and quantum mechanical simulation methods to study surface and interface physics at the nanoscale, with particular emphasis on working closely with experimentalists and technologists. We have comprehensive experience in applying first principles methods for studying nanoscale systems, including both quantum chemical and density functional based approaches, and static and dynamical treatments of atoms and electrons. Our research topics include nanoscale studies of friction, nanomanipulation, nanocatalysis, microelectronics, molecular electronics, self-assembly, solid-liquid interfaces, and are often partnered with state-of-art Scanning Probe Microscopy. Confused...education is at hand, explore the beautiful game. Many technological applications depend crucially on surface rather than bulk material properties, and the study of surfaces has become an important field within condensed matter physics. A few prominent examples are immediately evident – the environmental degradation of high-Tc superconductors; bonding between grains of alumina in sintered ceramics; passivation of metal surfaces against corrosion; biomedical substrates; improving and designing new solid-state gas sensors for pollution monitoring and control; studying electrode/electrolyte interfaces in fuel cells. In microelectronics, the ability to produce and control almost atomically perfect silicon surfaces has allowed the interface engineering crucial in fabricating transistors at the nanoscale – and this control of surface properties remains a crucial element in the development of the next generation of microelectronic devices. More recently, increased confidence in manipulation and fabrication of atomic structures on surfaces has opened the field of nano or molecular electronics and magnetism, with great technological potential. In each of these cases, and in many other applications where surface properties are important, understanding and controlling surface and interface physics at the atomic scale is the fundamental developmental goal required for optimization and, in cases like nanoelectronics, realization. We are very active in the simulation of Scanning Probe Microscopy (SPM), particularly Atomic Force Microscopy (AFM), Scanning Tunneling Microscopy (STM) and Kelvin Probe Force Microscopy (KPFM). In general, experimental studies of surfaces with atomic resolution are often difficult to interpret and simulations provide a link between measured images and surface topography and electronic structure. SPM techniques can be applied to the study of a wide variety of systems, including ideal and defective surfaces, molecular adsorbates, organic films, DNA, proteins, and the corresponding theoretical toolbox is equally wide. Surface science techniques, and particularly high-resolution Scanning Probe Microscopy (SPM) approaches, now offer unprecedented levels of understanding and control of solid/vacuum interfaces. By contrast, the physics of liquid/solid interfaces is less developed, although it is often more relevant for real-world applications. It is important in such diverse fields as heterogeneous catalysis, next generation battery technology and corrosion. The solid/liquid interface is also particularly relevant to biological systems, where measurements are made in physiological conditions. 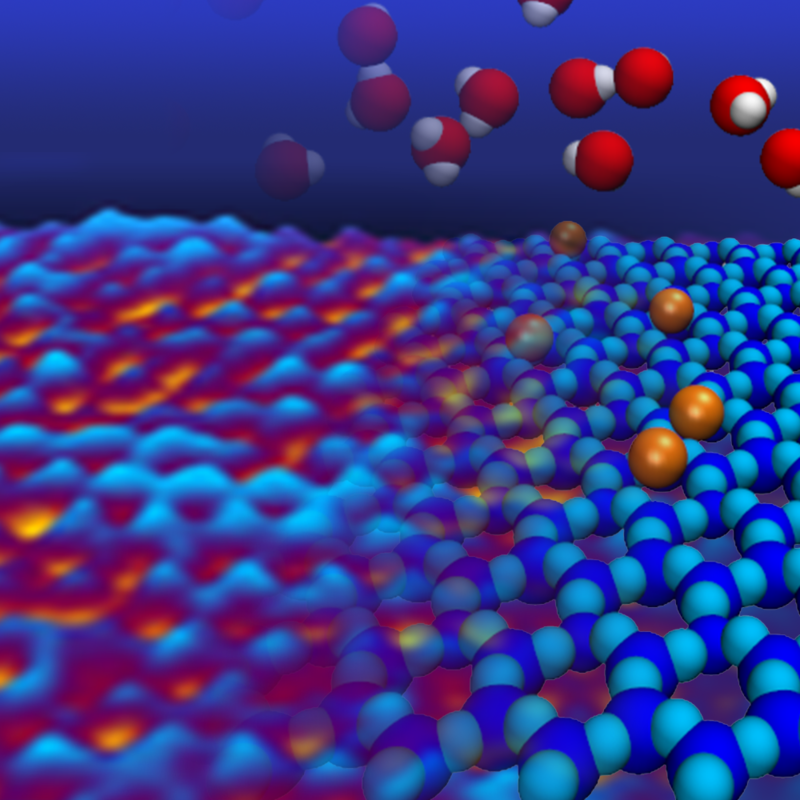 In this work we apply a combination of first principles and atomistic simulation approaches to study how liquids interact with a variety of insulating and organic surfaces, providing atomic-scale insight into hydration structures, dissolution, friction and high-resolution imaging. “Big data” and “Machine Learning” have become buzz words in information technology. Big data refers to data sets that are so large that traditional ways of human information processing can no longer process them. Instead, machine learning techniques are being developed for computer-aided data processing, and they now permeate ever growing parts of society, industry and market economies. 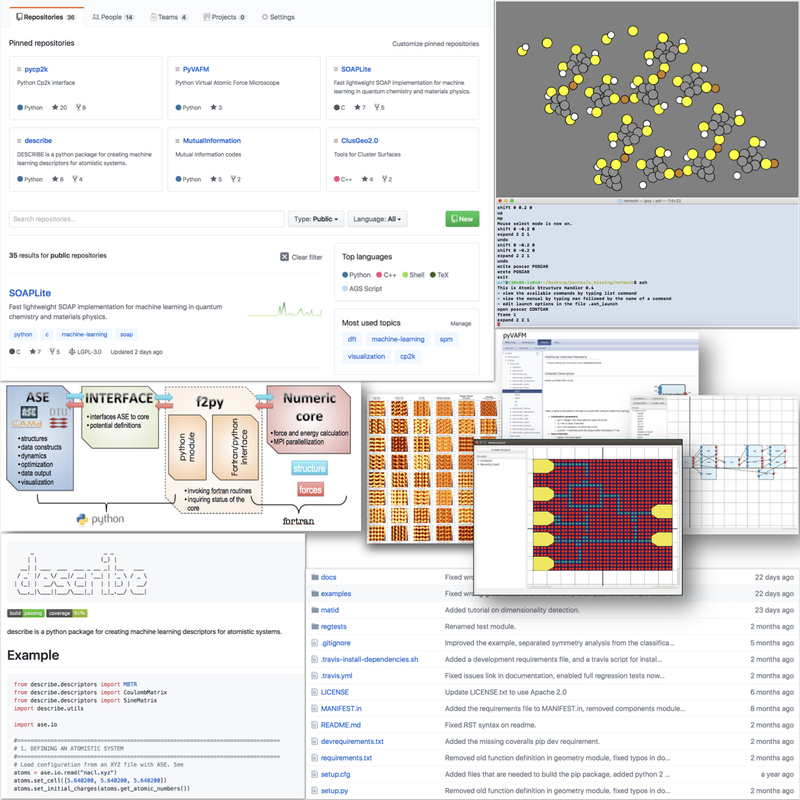 In collaboration with computational science groups and international data repositories, we are developing the infrastructure to gather, analyse and mine data produced by entire materials science communities – building up the technology to analyze large data sets (big data) and create the tools that add value (materials informatics and machine learning). We are developing these tools to support all of our research focus areas. As the scaling of the CMOS devices approaches its technological and fundamental limits, the replacement of silicon and its native oxide becomes one of the key challenges to sustain the continuous improvement of the IC performance. New semiconductors and dielectrics are at the heart of development of new and emerging high performance nanoelectronic devices. 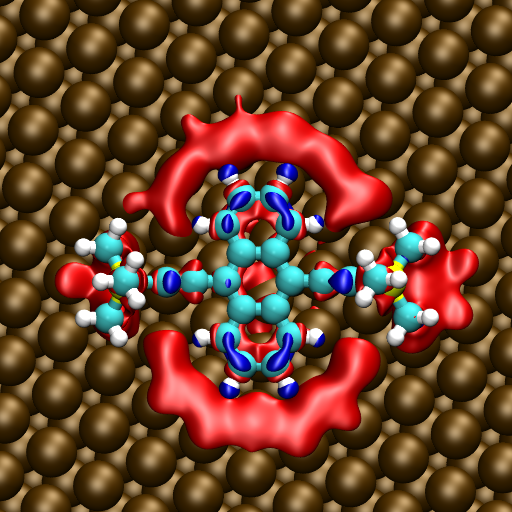 We use multiscale atomistic modelling to study the structure of interfaces and probable defects in next-generation materials, including devices based on 2D materials and molecular assemblies. This work also involves the development of methods for simulating thousands of atoms with high accuracy. Scanning Probe Microscopy (SPM) has become a dominant tool for the design and activation of nanodevices. SPM direct mechanical manipulation can be used to build nanosystems piece by piece. It relies on locally changing the migration barriers by close-approach with the SPM tip pushing or pulling the molecule. This offers local control of molecular properties, and is in principle viable for any system. More importantly, SPM provides in situ high-resolution characterization, allowing direct observation of the dynamics even at the atomic scale. 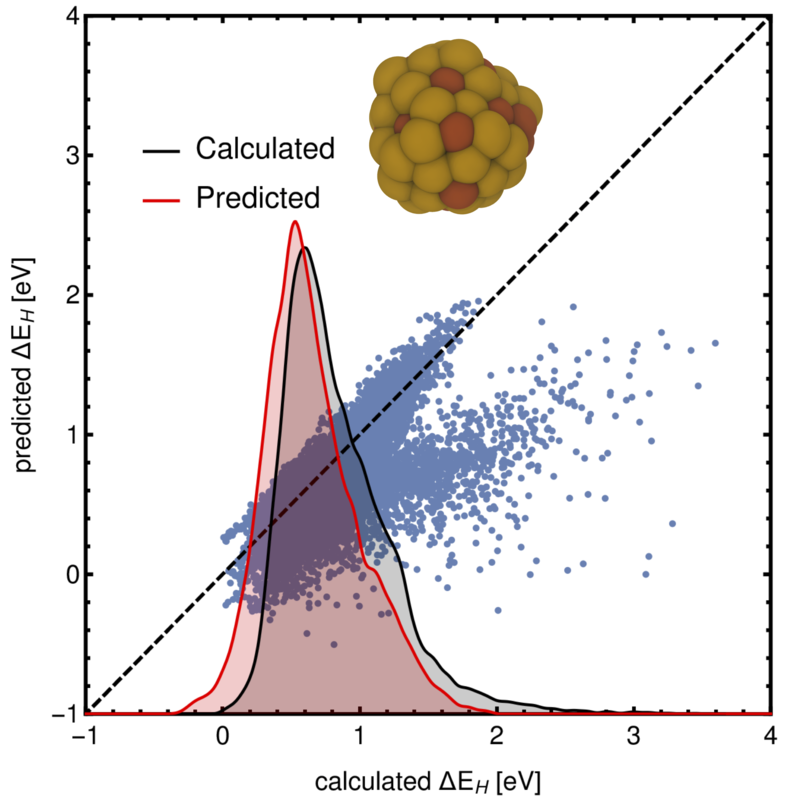 As well as being a tool for nanomanipulation, SPM provides a direct measure of the energy dissipated at the nanocontact between tip and cluster, and offers insight into the energy loss due to friction during manipulation. You can get our most useful software from GitHub. Part of the SIN group went on tour in Japan from 12th to 27th November 2011. They visited six universities, covering over 2500 Km by train and presented over 20 seminars. See the tour site for details.